Kim Yo-jong, a high-ranking North Korean official and the sister of the country's leader, is planning to visit South Korea for the Winter Olympics. Kim Yo-jong, the sister and close adviser of the country's leader, Kim Jong-un, is stepping into the spotlight by heading up the delegation to the 2018 Winter Olympics in South Korea. Kim Yo-jong holds a key role in North Korea's propaganda department, and she is an alternate member of the country's ruling politburo committee. Some analysts say she's a crucial part of the Kim regime, helping shape North Korean strategic policy as part of her brother's executive office. Kim Yo-jong is also one of the many high-level North Korean officials facing sanctions from the U.S. — but she should be able to travel to the games since she isn't internationally blacklisted. North Korea's participation in the 2018 Olympics is widely viewed as a chance for the country to ease the international tensions over its nuclear program. South Korean President Moon Jae-in has said he wants to reach out to the North, but it's not clear yet if he'll go so far as to meet with Kim Yo-jong. 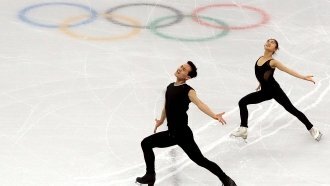 But the "charm offensive" seems to be falling a bit flat in the U.S. Vice President Mike Pence, who's also attending the games, has promised tough new sanctions against North Korea, and he warned that the country may be using the Winter Olympics to "paper over the truth about their regime."